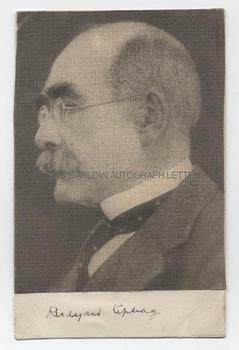 RUDYARD KIPLING Autograph Signature below newsprint portrait. 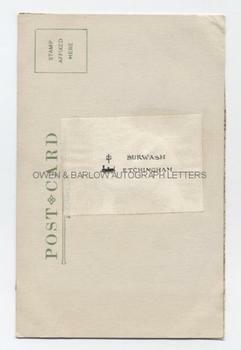 Newsprint portrait mounted on postcard, signed on strip of paper mounted below and with his 'Burwash, Etchingham' address label on verso. Approx 5.5 x 3.5 inches. From Kipling's appearance, the photograph for the portrait was probably taken around 1930. Provenance: From the album of a young lady compiled between circa 1925 to 1935. Her usual modus operandi was to extract portraits from newspapers and magazines and ask her 'victims' to sign them. From other items in the album it is evident that these were sometimes visitors to her parents' house and, at other times, persons to whom she had posted the item. The circle of her family's acquaintance seems to have been fairly wide but included a considerable number of military men, early aviators and the like.